When planning for your child we start from the most important place – your child! Each child is given their own key worker who works in partnership with you and other members of staff to ensure your child is given their own personal learning plan. This leaning plan is based on your child’s current interests and uses this information to help them develop further. When your child starts with us at Norto5 Kidz you will be asked to complete a simple questionnaire which will tell us more about your child’s likes and dislikes, as well as what they are able to do. We then use this information along with observations we have made of your child during their first 4 weeks with us to complete their individual learning plan. At this age your child still relies heavily on support from key people which is why we have a key worker system in place. Your child’s key worker will discuss with you your child’s individual needs and how we at Norto5 Kidz can help them to develop and learn. The key worker will then attend to your child as often as possible, for example at meal times, and allowing your child time to get to know them. Sensory toys are used in the under 2’s area to help develop your child’s sensory knowledge and staff ensure that there is a variety of items available. Children of this age obviously have their own routines and we will work with you to keep this as similar as we can when your child is at the setting, just let us know what time your child normally sleeps and feeds. Our quiet sleep area means a cot is always available, and your child will be given their own individual cot for that day. Please feel free to bring in any items which will help them to settle, such as comforters, sleep bags, blankets etc. Even at this age your child will have their own individual plan which will highlight areas for staff to work toward with your child. This plan is based on what your child is interested in, which is taken from observations on your child, such as smiling when sung to. As you will have most likely noticed, at this age your child has started to explore their environment. We have a separate under 2’s area, which means your child is safe and secure as they start to explore. The area also has soft mats, which allows your child to explore on a safe surface, especially as they start to pull themselves up, and we have various push along toys which encourage your child to stand and walk. The under 2’s area has lots of toys which are suitable for this age range, which they are free to explore to help them develop their skills. Your child still relies on a key worker and so the key worker is still an important part of your child’s day to day experience at the setting, and in their development. Your child is given lots of interaction to help their communication skills to develop, especially as they start to express their needs and feelings. Your child also starts to become more aware of other children and we will offer appropriate opportunities for your child to play alongside the older children, especially at times such as messy play. As they move onto solid food we have specifically designed chairs which allow us to feed your child at the same time as the other children, allowing them to take part in the social occasions of snack and meal times. As with younger children we know how important a routine can be for a child of this age and so continue to work with you to ensure that they have a similar routine both at home and at the setting. By now your child is becoming increasingly mobile and will be spending more time with the older children. Our large outside area, which we use all year round, allows them plenty of opportunities to be active, and our grass area means they have a soft area to explore. 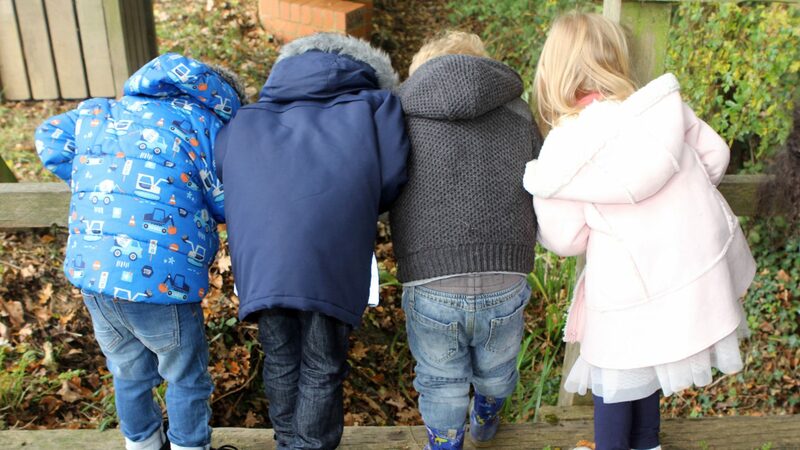 Going outside also means they have chances to explore the wider world – children love watching for the buses and planes, as well as birds and dogs in the park. For quieter times we have a book area and of course the under 2’s area is still available for this age group. Children of this age also start to explore a different range of toys and so we have toy boxes which are accessible at all times. Favourites include the mega blocks, which help to encourage problem solving, and the ball pit, which helps to develop physical skills in throwing and kicking. Sleeping and rest time is still important at this age and your child is given opportunities to rest throughout the day, either in the sleep area or in the book corner. In the book corner age appropriate stories are told and songs sung throughout the day to help your child develop their language skills. While still close to their key worker, your child also starts to play with other children and there are plenty of opportunities for this to happen, with a member of staff nearby to offer support when needed. As your child becomes more confident at feeding and sitting we use a harness and straps that allow them to sit on a “big chair” at the table with the older children, while still sitting securely. Your child may become interested in creative play, and finger painting is a favourite with younger children, along with free sticking and mark making with chunky pencils and crayons, all important ways for your child to start developing their handwriting skills! Please ensure your child has spare clothes as they may get messy – even with aprons on! From this age children spend the majority of their time in the main area. Sleep time is still available for those who need it, and we have mats which we use for when your child outgrows the cots. Most children in this age range have a nap after lunch but again we will work with you to ensure the best care for your child. Your child will probably start toilet training around now (if they haven’t already) and again we will work with you to ensure this is done in the best manner for your child. Pull ups are provided if needed, and we have plenty of potties and child accessible toilets. This time of your child’s life is important for their social development and so we offer lots of small group work for your child to take part in. Examples of these activities are painting, sand play and playing with small world toys, such as trains and cards. Children are encouraged to solve problems by themselves, with a member of staff on hand to help them when needed. The role play area helps your child to develop their social skills. As well as our home corner we have an area which changes depending on the children’s interest; so far we’ve had a magic garden, an aeroplane, a shop a travel agent and many others! This is also an age when your child’s vocabulary increases rapidly, and to help your child in this important part of development we ensure that there are plenty of language opportunities for them, including singing and story time. We have lots of discussions throughout the day, talking about what is happening and what we are playing with, encouraging the children to talk about what they see and how they feel. This is a very active time for your child and so we offer lots of opportunities for your child to practice their physical skills. Children are encouraged to spend lots of time outside, playing on the bikes, slide and seesaw and when possible we visit the local park where there is larger equipment for them to climb on. We have an indoor climbing frame for when the weather is against us! Children of this age start to take an interest in the computers we have available at Norto5 Kidz. Our computer is equipped with a child friendly keyboard making it easier for the younger ones to access and our paint game is a firm favourite. We also allow supervised access to the Cbeebies website which has some great games for this age range. This is the age of increased independence and our freedom of choice philosophy means your child can choose what they want to do and play with, in a safe and secure environment, while at the same time learning about boundaries. Children of this age enjoy taking part in role play and our dressing up box has lots of costumes for them to explore and make believe in – who knows what they will be next! Children of this age start to play more with other children, rather than alongside them, which adds a new dimension to their play. Our small world area really helps them develop these skills as they build towns together from the duplo and make tracks for the trains. Mark making is available to help develop their handwriting skills and help is offered to those who start to develop their writing, though please note that we do not teach any formal skills. Instead children at Norto5 Kidz learn through play, at their own pace, and by taking part in activities that interest them. Your child’s individual plan will take their interests into consideration while planning ways to help them develop. Children of this age also enjoy spending time in the book area and like to read the books to their friends. Our staff members read to them and talk about different topics such as the weather, the seasons, days of the week and any other topic the children might be interested in. All this helps to develop their understanding of the world and encourages them to form their own opinions on topics. We help to develop your child’s development in numeracy by having numbers around the setting and by encouraging your child to count and think problems through. Again this is done in an informal way through their play helping them to develop an understanding in real life situations. Towards the end of their time at Norto5 Kidz we work with you to help your child prepare for their next step – normally reception class at school. Once you know which school your child will attend we ask that you inform us and we will arrange a visit to the school with your child and any others from the setting who are going there. We will talk to your child about going to school, look at different books on the subject and have uniforms for the children to investigate, helping them get used to their new clothes. All this helps them in their next step as they finish their time with us.